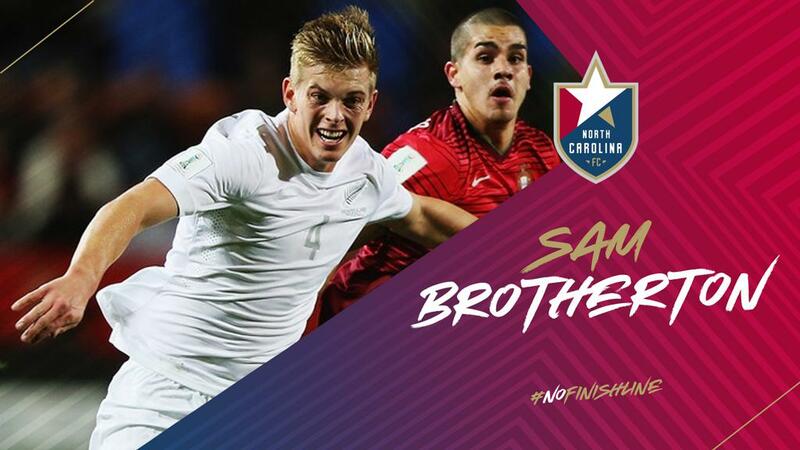 CARY, N.C. (January 29, 2019) –North Carolina FC has landed a big signing for 2019 with the addition of New Zealand and former Sunderland center back Sam Brotherton. The signing is pending league and federation approval, as well as receipt of his International Transfer Certificate and P1 Visa. The 22-year-old already has a wealth of international and professional soccer experience. A key starter for the New Zealand national team, Brotherton has made 15 appearances at the senior level for the All Whites, including action in World Cup qualifying matches. Brotherton was also selected to the New Zealand squad for the 2017 Confederations Cup in Russia. He’s represented his country at the 2015 U-20 FIFA World Cup and at the Pacific Games with the U-23 team. Brotherton earned a professional contract with Sunderland in January of 2017, where he primarily played with the Sunderland U-23 squad. Most recently, he was loaned out to Blyth Spartans of England’s National League North, but saw limited playing time due to an injury. Prior to his stint in England, Brotherton spent two seasons at the University of Wisconsin. He made 33 appearances for the Badgers en route to making the Big Ten All-Freshman Team in 2015 and earning All-Big Ten Second Team honors in 2016. The New Zealand native also played in the ASB Premiership – the top flight of New Zealand soccer – with Wanderers SC in 2014 where he notched 1,440 minutes in 16 appearances. North Carolina FC’s roster includes goalkeeper Alex Tambakis, defenders Sam Brotherton, Aaron Guillen, Timmy Mehl, Steven Miller and DJ Taylor, midfielders Austin da Luz, Dre Fortune, Victor Igbekoyi, Austin Panchot, Graham Smith and Duval Wapiwo and forwards Yamikani Chester, Donovan Ewolo, Robert Kristo, Marios Lomis and Ben Speas. Transaction: North Carolina FC has signed Sam Brotherton.